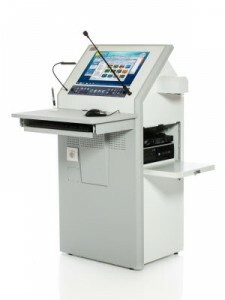 A pioneer in the development of high-tech lecterns, Tecom has launched a new design for its’ TecPodium Interactive Lecterns, to Universities and Colleges. “We’ve now included our latest and fastest technology in the podium and made the design modern, colorful and effective” says Aviv Brosilovski, Tecom CEO. This entry was posted on Tuesday, January 8th, 2013 at 11:14 @510 and is filed under Scuttlebut. You can follow any responses to this entry through the RSS 2.0 feed. You can leave a response, or trackback from your own site.